Coming from Koblenz is maybe not the best prerequisite to become a part of the Weilheim school. And anyway, while most people still remember fondly (or less fondly) the Hamburg school, Weilheim has always remained more of an insider secret, with the family of The Notwist, Ms John Soda, Lali Puna, Tied & Tickled Trio and Console always walking the thin line between great electro-acoustic indie pop and incestuous member swapping. The fact that Oliver Gräfen, the man behind Riamiwo (stands for Run Into A Mindworm), counts all these aforementioned bands to his favourites shows already more than necessary into what direction he is heading. 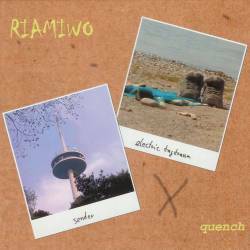 Quench, his second album, comes with eight songs that have a rather soporific effect on the listener. The genre, which is fashionably called indietronica these days, is a combination of mellow electric guitars and other assorted rock instruments with loopy drums and soothing keyboard layers. It's not bad at all, but also not daring enough to break free of the inherent limitations. Meaning: from the first song to the last, we are confronted with sleepy songs that are probably awesome when you want to chill out after too much loud music, but when compared to his inspirations, Riamiwo is still lacking tension and energy. Even the three vocals song (Confidence, I Should Know, Double-Minded) are done in such a timid way that you hardly notice the change from the majority of instrumental songs. So yes, this is basically bedroom music, the kind everyone with talent and a performing computer can do these days. I have heard it much better (Wixel, Greg Davis), but of course also a lot of times done much worse. Quench is just an alright album, even charming at times, but too short and uninvolving to become a classic of its genre.